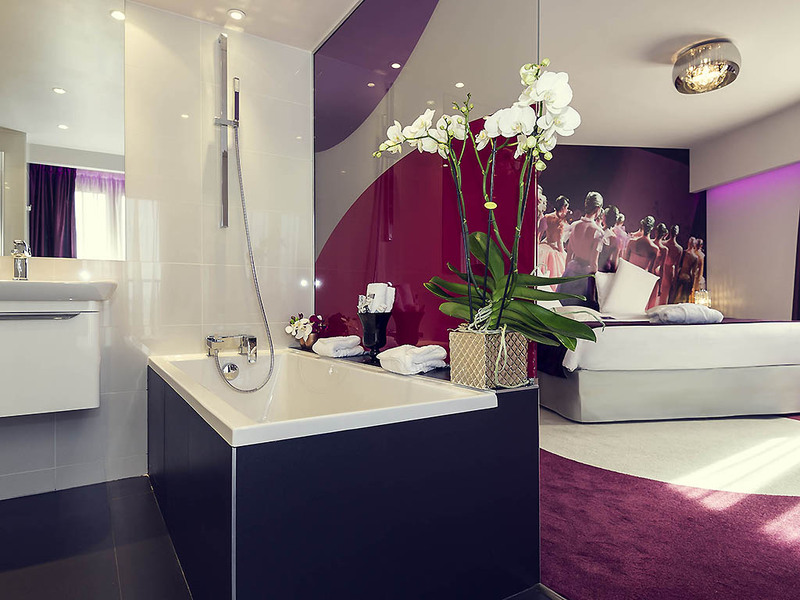 Welcome to the Mercure Paris Place d'Italie hotel. Discover the capital from this wide, tree-lined avenue in a picturesque neighborhood. You will love the fashion-inspired décor that creates a warm and friendly atmosphere. Located in the heart of Paris, near the Butte aux Cailles district and the Latin Quarter, the Mercure Paris Place d'Italie hotel offers customized services for your meetings. This hotel provides direct access by metro to Gare Montparnasse and Gare d'Auste rlitz. It has comfortable rooms with views over the Panthéon and the Eiffel Tower. With family, friends or after a meeting, come and relax in our cozy bar, open 24 hours. By choosing the Paris Place d'Italie Hotel, you'll have the opportunity to stroll through Montparnasse, the Latin Quarter, the Chinese Quarter, and the Butte aux Cailles. You'll enjoy all the attractions of the capital. Choose from the Standard category, with spacious rooms with an elegant and refined decor, or the Privilege category, with views of the Eiffel Tower and the Pantheon, where you can enjoy a wide range of services. As a non-member guest, the breakfast should be improved comparing with other accor hotels in Europe. There a few choice for breakfast. As a platinum member of accor, nomarlly, we've the rights to ask for a late check-out. Actually, we asked for late check-out in the first time (in the day of check-in), the answer was "You should come back in the morning". The second time I came back for late check-out, The answer was "Late check-out at 5 PM costs at 60 Euro". Then I asked what about free of charge, the answer was 1.30 PM late check-out. Frankly, the accor hotels I've been stayed They were all no costs for late check-out. One more thing, we've got welcome drink voucher as member, then we redeemed it. The staff gave us one drink, even we're couple. Then, I asked for another, The staff told me everywhere in France giving only drink. Can anyone tell us? Is it true? We went to many countries, we've got 2 drinks everywhere!!! The staff face was really not welcome for us. One more thing, we've got welcome drink voucher as member, then we reedemed it. The staff gave us one drink, even we're couple. Then, I asked for another, The staff told me everywhere in France giving only one drink. Can anyone tell us? Is it true? We went to many countries, we've got 2 drinks everywhere!!! The staff face was really not welcome for us. On the other hand, the time we left, the staffs were really friendly 'n helpful. That's all about this hotel. Personally, I would say "No 2nd time to stay here"
The room was very comfortable, if a tad on the small side, nice bathroom, and quiet despite being near the Place d'Italie. When entering the room, I was a bit surprised by the giant photo towering over the back wall of the bed: mannequins in gala dresses turning their backs to the observer. I am not sure about the taste, but it did not disturb my sleep! Breakfast was ok.
stayed for 2 days for business. easy access to public transport. small but clean rooms. wlan works fine. good and fresh breakfast. friendly staff. Ideal for a short weekend trip. Excellent reception staff, good restaurant recommendation, friendly and informative. Friendly breakfast staff. Room was satisfactory but noisy as the window was single glazed. As usuall the staff at reception and in the restaurant were very friendly and helpful. Very nice and helpful people at the reception desk. Room,very clean,spacious. Well situated close to the metro,commercial center. Polite staff, great clean room, very comfortable bed, rich buffet for breakfast abd located very close to the metro station. Great choice. GREAT breakfast. All the rest is ok and reasonable. Good, clean room, quiet = no distractions for good sound sleep/rest Very good breakfast One remark: It was not easy to come into the hotel lobby later in the evening (starting at about 9pm or 9:30pm) when the sliding doors would not open. The problem was that it was not very obvious how to get the doors to open or how best to signal the staff to open the doors to let oneself in. Perhaps this can be improved. Staff was completely dull. Not bad but not shining with enthusiasm. I have been asked to confirm my time of arrival. Probably in a poorly disguised attempt to clean my room later than the check-in time. Rooms are tiny and noisy. No upgrade proposed despite being a Gold member. Room was very clean, the housekeeping did a good job. Fairly mediocre hotel in Paris. Has all you might need (except hand towel holders in the bathroom), but it doesn't 'feel' like a four-star experience. Tiny breakfast buffet staffed by one person only, but with a good range of choices. Strange decoration throughout the hotel, with a half-hearted fashion theme which feels like it was put together by a teenager. Very good public transport connections, clean rooms (soundproofed well from traffic, but not so much from noise within the hotel) and friendly staff. I would stay here again for the price, but I wasn't blown away. Everything was clean. Bed was comfy.